(Verso) signed in purple pencil, at lower right corner: " - Paul Strand - / - 1916 - "
I was in Connecticut, and the simplest of subject matter, or maybe object matter would be a better term in this case--such as kitchen bowls, cups, plates, pieces of fruit, a table, a chair, the railing of the porch, the shadows of the railing of the porch--things as simple as that were my material for making experiments to find out what an abstract photograph might be, and to understand what an abstract painting really was. Thus Paul Strand recalled in 1971 the approach he took to create abstract images more than fifty years earlier. 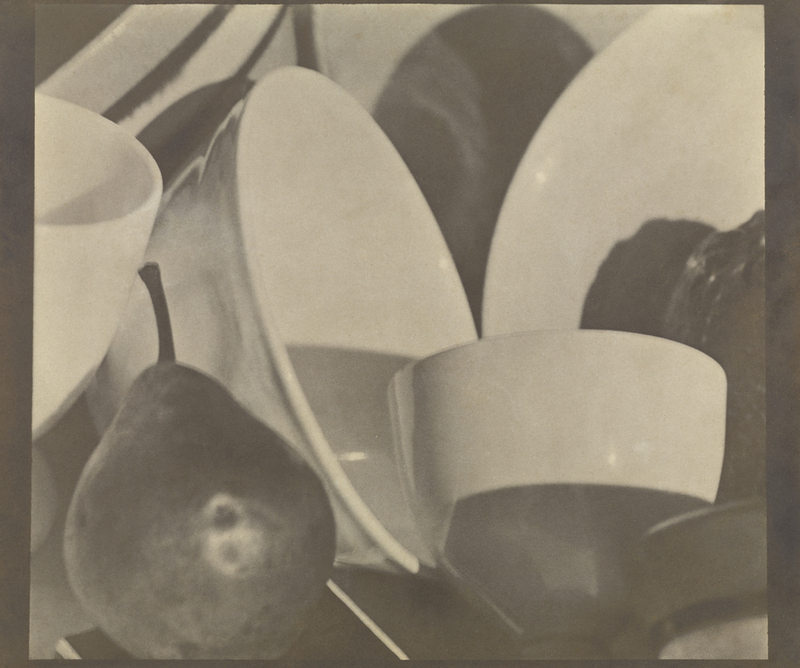 This still life configuration of dishes and fruit becomes a formal composition of arcs and curves. The objects transcend their everyday function to become lines and shapes defined by the dramatic lighting. In this lesson students learn about and discuss why photographs are made.